IDEAL FOR : STD, AGM & GEL 12V batteries from 3 – 240Ah. Multi-stage desulphation: Restores neglected batteries from as low as 0.5 Volts. 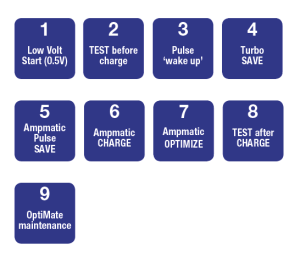 Ampmatic charge control: adjusts current to suit any battery size (3 to 240Ah) OR condition for fastest and most complete charge. 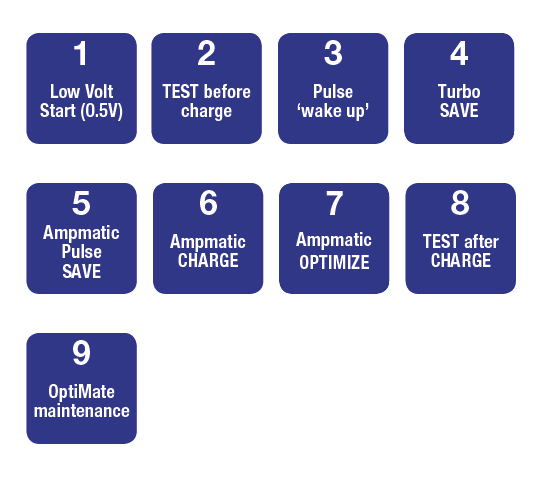 Cell voltage balancing mode: correctly prepares NEW batteries for first use and optimizes battery performance. Daily battery condition tests & interactive float charge: maintains battery fully charged, weeks or months long.